disadvantaged and needy of the region! Its cold this winter and there is no better time to just curl up with a good book! 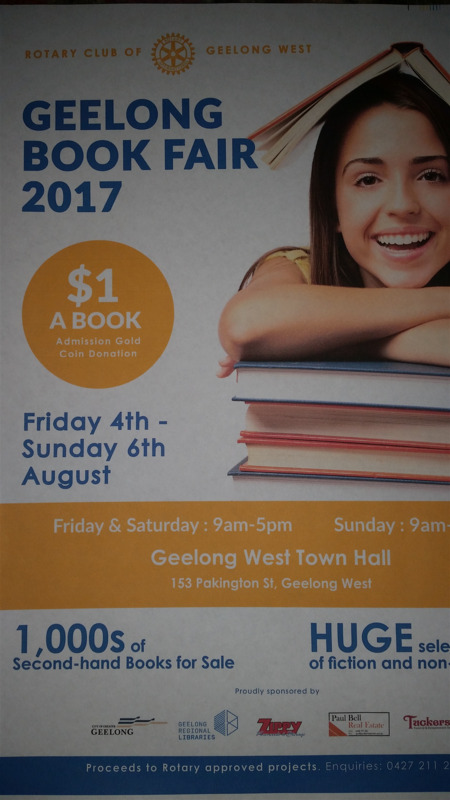 The Rotary Club of Geelong West is once again giving the opportunity to stock up on your winter readingwith $1 books. Thousands of books from every genre for just $1The Club’s Monster Book Fair will run from Friday 4 August to Sunday 6 August at the Geelong West Town Hall, and there have never been more books to choose from! “The Book Fairs grows in popularity every year!” said new Club President, David Dadds. “and we think that visitors to the Fair are not only there to pick up a bargain, but they know that every dollar they spend is going to be used to benefit the community of Geelong in some way.” The Book Fair helps to raise much-needed funds for a variety of programs chosen by the Club – one of which includes the very important Barwon Health Volunteer Patient Transport program. In recent years, the Rotary Club of Geelong West has been pivotal in bringing all Rotary Clubs in the region together to contribute to the ongoing supply and maintenance of patient transport vehicles for the Barwon Health Foundation and proceeds of the Book Fair makes the significant contribution from the Geelong West Club possible. The vehicles provide transport for patients who are undertaking debilitating treatments such as chemotherapy, radiotherapy and dialysis; transporting them to their treatment and then comfortably home again. The Book Fair has become so popular in the region that the Club now hosts it twice a year. The Fair will have over 30,000 books for sale. Many of these books have been supplied to the Club by the Geelong Regional Library Corporation, which has been a most generous and valuable partner of the Book Fair since its inception, as well as donations of books that are received from generous readers in our community. In addition to the Geelong Regional Library Corporation, the Rotary Club of Geelong West is grateful once again this year for the generous event support received from the City of Greater Geelong, Tuckers Funeral Service, Zippy Removals and Paul Bell Real Estate. The Geelong Book Fair opens at 9.00am on Friday 17 February.